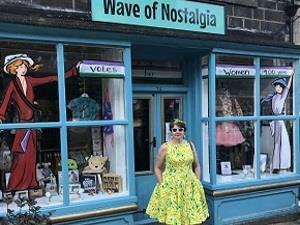 Wave of Nostalgia ShopCarefully selected dresses, suits, coats, furs, accessories, linen, collectables and crockery from the twenties to the seventies, chosen for their style and beauty and made available for you to start or add to your collection of lovely vintage things. Carefully selected dresses, suits, coats, furs, accessories, linen, collectables and crockery from the twenties to the seventies, chosen for their style and beauty and made available for you to start or add to your collection of lovely vintage things. Diane also uses her skills as a dressmaker to craft clothes from original forties, fifties and sixties patterns in lovely fabrics made to measure to fit you perfectly. She also up cycles clothes giving them a unique twist. Her aim is to unlock the hidden potential of vintage clothing to enable it to be loved again. True style is about having self-assurance to carry off a look at any age. Please check for opening times before visiting.